I’m not going to lie, winter is not normally my favorite time of the year. I don’t like that the days are shorter. And colder. And drearier. I get the winter blues easy especially after all the bright, festive Christmas decorations have been taken down. So, I’ve had to find ways to beat those winter blues…and here’s how I do it. Cheery, upbeat music. Praise music. Anything uplifting. Especially when I write, I almost always have music going on in the background. Getting out of the house, even if the weather is a little damp and chilly. Sitting in a coffee shop or library often helps to lift my spirits. Meeting friends for lunch, or getting out to do things with my church family often help to keep the glooms away. Sneaking off to the movies. There’s nothing like being transported to another place when the place you’re at isn’t all that great. A bag of popcorn (or candy) and a big icy soda doesn’t hurt, either. And I’m not sure about your area, but the theaters around my place have all updated to the reclining chairs! Sweet. Some even offer food service right at your seat, no waiting in line. And of course, besides getting lost in my own stories while I’m writing my next book, I also enjoy getting lost in stories that other people write. There’s nothing better than snuggling up on the couch, especially if it’s a rainy day, under a cozy blanket. Extra points for a fire burning in the fireplace if you have one. How about a warm cup of hot chocolate or tea to top it all off? I know that many people love the winter! And that’s great. For those who are dreaming of sunshine and warmth, what do you do to keep your cheer factor going? While I’m on this topic, I’d like to offer a bundle of stories all based around the winter season. A Merry Little Winter will carry you from Christmas all the way up to Valentine’s day. Best of all, you get all this sweet romance escape for only .99¢! Can’t beat that. Not sure how long this bundle will be available, so grab it while you can. Today, I’ll pick one commenter who will receive a free copy of A Merry Little Winter. And I hope all of you have a wonderful New Years Eve! Stay safe and see you in 2019! I am a huge fan of winter…and yes, I live in Florida now, but I grew up in NJ and miss the cold snowy days!! No matter what the weather, I can totally be behind the snuggle up with a book and warm drink, even if I need to put the AC on! I’ve had several friends who admitted to snuggling under a blanket with the fan on. Ha. Hi Jackie! As a Michigander, I enjoy the four seasons. So far this year winter has been mild. Yesterday our temperature was in the mid forties. Unfortunately living within a mile of beautiful Lake Michigan has its disadvantages during the winter months. Sometimes we have had thirty days of cloud cover and gloom. This winter we have some nice sunny days. We tease “what is that orb in the sky?” Love your list to beat the winter blues. As retirees we get out as often as we can. Our local movie theater also as reclining seats and as a Christmas treat we saw “Mary Poppins Returns.” The movie made us laugh and appreciate our modern times. The music reminded us of our youth and the original movie. Definitely got us out of the Winter Blues. 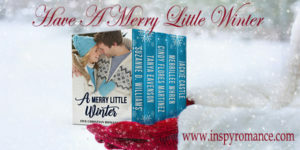 I enjoyed reading the romances in A Merry Little Winter boxed set. Still have one story to go and then will post my review. Some new authors that I have not encountered before. As a Michigander I enjoyed your story The Heart Collector and your Madison Creek Town Series. You weave a compelling well written page turning romance with a small town Michigan setting, likable characters, and clearly resolved resolution. Details from previous stories in the series are seamlessly woven into the story. Satisfy balance between narrative and dialog. Consistent point of view. Jackie Castle is an expert story teller. Best wishes and Happy New Year. Thank you so much, Renate, for your kind words. Yesterday we took grand-doll (who is 3 1/2) to see Marry Poppins Returns. I think she really enjoyed the movie, maybe not as much as I did, but she doesn’t care for the loud theatre sounds. I loved the original Mary Poppins, and not sure how I like these refurbished movies, lol. I may have to take your word on it, Renate, as I totally trust your judgement! Mary Poppins Returns isn’t a redo of the first book. It comes from P. L, Traver’s many other Mary Poppins books. (I think Mary Poppins Comes Back) It’s a completely new story with the grown Banks children and their children. The story had a great message and the music and characters were as wonderful as the first ones. I highly recommend it. I love the cozy-up factor of winter! I love the crisp air and the glistening snow under bright blue skies, and I love the sight of softly falling snow. The main thing I don’t like about winter is driving on snowy, slushy roads. Definitely a fan of reading by the fireplace with a cozy throw and a kitty. Beverage of choice: hot mocha… which regretfully must make way for herbal tea later in the day. We don’t get the wonderful snow down here in Texas. When we do, it’s always a treat. So long as we don’t have to drive in it. I’m still holding out hope that we’ll have some snow this year. Everything closes down if we do, so it’s like a special little holiday here. haha. I am so addicted to your mocha, Valerie! I don’t like winter either, but I enjoy reading books about winter. I think it’s the shorter days that I don’t like most. I do like the cooler weather. And yes, I read books in all and about all seasons. ha. I love the cooler weather.My fans are on year around. I adore snow, but that might be because I live in Michigan! I beat winter or holiday blues by reading and fun music. The only reason I’m not a fan of winter is the dark days. It gets dark by 5:00. Thankfully, we are past winter solstice so the daylight will be increasing a bit each day. Yay! I love cool temps. But I really like sunshine. I’m a sunshine girl, too. Probably because I grew up in sunny, warm California. It’s dark here in Texas before 6pm. I hate being cold and cooped up. I use the time to clean closets, straighten cabinets and drawers. Winter is a good time for some deep (inside) cleaning. I don’t like snow, but, I don’t like hot weather, either! It was warm, but, raining today in Alabama. Happy New Year Jackie! Blessings! That sounds romantic. I do wish Texas had a few snowy days. It’s beautiful when we do. Thanks for stopping in everyone. I’m sorry it took me so long to announce a winner of A Merry Little Winter, but we went out of town at the last minute. Anyway I’m back and here to announce that Priscila has won an ebook copy of our romance collection. I’ll contact Priscila shortly.